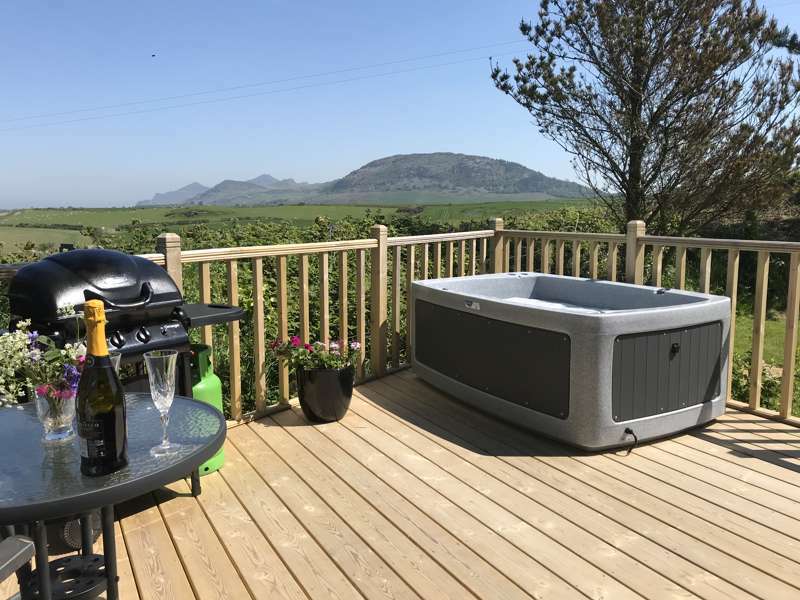 Tan-y-Capel Hideaway is located on the gorgeous Llyn peninsula an area recognised for its outstanding natural beauty combining fabulous sandy beaches beautiful rolling countryside and spectacular hills and mountains. Our cosy new pod has a wonderfully comfortable bed with cotton fresh bedding, soft throw cushions and pillows. There is a shower room with luxury toiletries and soft fluffy towels. The kitchenette contains fridge and microwave with bbq outside for additional cooking. The pod has double doors that open onto a generous private decked area where the hot tub sits, a wonderful addition to our already stunning pod. Whatever the weather or outside temperature you can sit amongst warm relaxing bubbles with a glass of prossecco admiring the stunning view or watching the simply fabulous sunsets and at night time gazing up at a night sky that contains more stars than you can ever imagine. Once finished in the hot tub there are fluffy towelling robes and slippers along with throws and fleeces to keep you cosy and warm. We have wild flower meadow and fields to wander through and enjoy the peace and tranquility of this beautiful place. We are keen to welcome are guests and ensure our guests have a wonderful stay so any questions or information re things to do and places to visit please don't hesitate come and have a chat. For latest availability and best prices for Tan-y-Capel Hideaway, please use the Date Search above. Pod sleeps 2 on a double bed and an additional guest on a single futon. Bedding, pillows, throws and cushions included. Facilities include a kitchenette with fridge, microwave, toaster, kettle, cutlery, crockery and cooking utensils, plus an en suite bathroom with shower and proper toilet (luxury toiletries, bath robes and towels provided). TV/DVD player available. Outside a BBQ is supplied (gas included) beside a private hot tub. Tea, coffee, sugar and milk included with welcome pack. The Llŷn Peninsula is one of Wales’ most captivating coastal regions. Explore its many stunning beaches like Porth Nefyn (2 miles away) or Porthdinllaen (3 miles) home to one of the world’s best beach bars. For surfing (of the board, kite and wind variety) Porth Neigwl is excellent or you could spend a day at chic Abersoch, the sailing capital of Wales. There are several more hidden spots along the coast that are only accessible via the Wales Coast Path – just ask your hosts for the best walking or cycling routes. Further afield, Caernarfon and Criccieth are well worth a visit, not least for their castles and stunning views (the former’s overlooking Anglesey). The extraordinary Italianate village of Portmeirion (as seen on 60s cult classic TV series The Prisoner) is another essential stop. And with golf is your thing, Nefyn & District Golf Club (01758 720966) is less than 10 mins drive away. Pwllheli and its environs boasts plenty of pub and places to eat. Y Bryncynan (01758 720879) is less than 2 miles away at Morfa Nefyn. They serve real ales and wholesome pub grub from breakfast through to evening meals. The Ship Inn (01758 720559) at Edern serves exquisite dishes such as Welsh beef wellington and pan fried hake. Be sure to book ahead for Sunday lunch. The Cliffs Inn (01758 720356), also at Morfa Nefyn, is a great spot for lunch with a spacious sun terrace overlooking the sea. But for views, the pick of the pubs has to be Ty Coch Inn (01758 720498). Regularly voted one of the world’s best beach bars, the beer garden here is the golden sands of Porthdinllaen beach. Other worthy dining options include Plas Bodegroes (01758 612363) and Tremfam Hall (01758 740169) which both come highly recommended by your hosts. From Pwllheli, follow A499 through the town. On reaching the roundabout, take the 2nd exit onto A497 towards Nefyn. Continue for approx 6 miles then at the roundabout take the first exit for Dinas / Edern. Take the first left, then turn right at the next crossroads past Groesfford house. Continue along the lane, with the chapel on your left. Take the first right into the entrance. A single luxury camping pod (sleeping up to 3) with hot tub.